In 1948, the first World Health Organization felt the need to create a World Health Day and and from 1950 the World Health Day was celebrated on 7 April each year.The purpose of this day is to raise the level of knowledge at global level to a particular health issue and to draw attention to priority areas to deal with the World Health Organization. 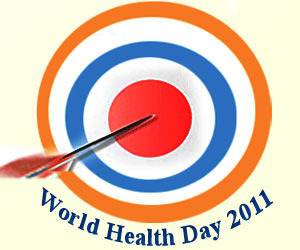 World Health Day 2011 theme is resistance to antimicrobial agents and slogan that you can heal is Act today to hill tomorrow, calls for increased global commitment to protect the effectiveness of these essential medicines for treating infectious diseases for the benefit of future generations. Flu, colds,the most sore throats and bronchitis are caused by viruses, not by bacteria,and use of antibiotics can do more harm than good because antibiotic-resistant bacteria can infect other people and can spread from one country to another. Antimicrobial resistance occurs when microorganisms such as bacteria, fungi, viruses and parasites are modified so that antimicrobial drugs (antibiotics used against bacteria) are losing their effectiveness due to natural adaptation of microbes or inappropriate use of medicines. Microbes who become resistant to multiple antimicrobial agents (often called “superbugs”) are especially feared, because an untreatable multidrug-resistant infection can kill, and can spread and lead to huge costs for individuals and society. Among antibiotic-resistant microbes are included bacteria such as Escherichia coli , Myobacterium tuberculosis (TB case), Neisseria gonorrhoeae (the cause of gonorrhea), Staphylococcus aureus and Streptococcus pneumoniae – if it’s community, or Enterococcus faecium and Enterococcus faecalis – whether it is hospitals. In the world occur annually around 440,000 new cases of tuberculosis resistant to multiple antimicrobial agents the cause at least 150,000 deaths. Resistance to antimalarial drugs such as chloroquine, is widespread in most malario-endemic countries. Resistance is becoming a worrying concern for the treatment of HIV / AIDS as a result of increased access to antiretroviral drugs in recent years. Antibiotics are drugs extremely important for treating or preventing all types of infections caused by bacteria. However, since we use more antibiotics , the more bacteria become resistant to them. It is a natural phenomenon and occurs worldwide, particularly where antibiotics are used and misused in excess. They used to be balanced when they are necessary for therapeutic reasons. Unfortunately a new series of antibiotics will not occur very quickly, whereas research and drug development requires huge investments, which will be made only if future income is considered profitable for pharmaceutical companies. In these circumstances, if not cease the abuse and misuse of antibiotics, they can not work when people need them. Imagine that your doctor would tell you that there is no treatment for your child or a friend, because he has a bacterial infection that can not be treated with antibiotics. In this time already in the EU, Iceland and Norway 25,000 people die each year because of bacterial infections who do not respond to antibiotics, most of them occurring in hospitals. The society could return when the antibiotics weren`t discovered, when a simple infection could mean a death sentence . Resistant bacteria occur and spread rapidly. At present, some bacteria are resistant to multiple agents, making the risk of deadly infections, such as the blood or pneumonia, to be potentially untreatable. In addition, loss prevention through effective antibiotics can make more advanced medical interventions and diagnostic tests (such as arthroscopy, hip prostheses and operations of the colon) become impossible, because the antibiotics would not provide protection against bacterial infections. Antibiotic resistance is an urgent issue for everyone. To stop growing it, everyone has the responsibility to use antibiotics only when needed and only with prescription. – refusal of self-medication may be beneficial to his health and for the present and future communities. Abuse and misuse contributes to antibiotic resistance, and it generates more severe illness and unnecessary deaths. Antibiotic resistance can lead us back to the prebiotic was when a common infection can easily lead to death. If you do not act now, tomorrow we will not have to deal with! The emergence of antibiotic resistance is a natural biological phenomenon that occurs after antibiotic use. Antibiotic resistance resulting from the ability of bacteria to resist the attack of antibiotics, which can occur either by mutation or by acquiring resistance genes from other bacteria already resistant.